Involving local people in figuring out how to improve their farming and fishing methods provides more lasting and widespread benefits than just introducing new technologies or methods, the researchers showed. The findings are described in the journal Agricultural Systems, in a paper by Boru Douthwaite of the research funding agency WorldFish, based in Malaysia, and Elizabeth Hoffecker, lead researcher at the International Development Innovation Network (IDIN), based at the MIT D-Lab. 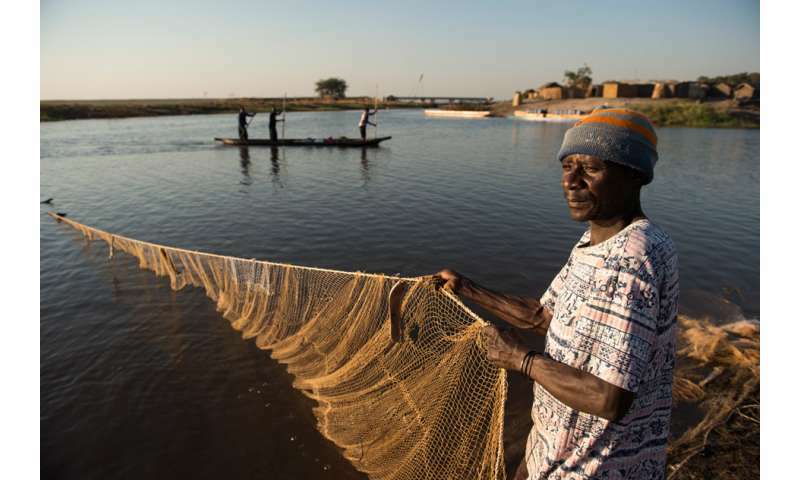 The Zambian fisheries were facing two related issues, Hoffecker says: "The narrow challenge was to come up with a way to prevent fish from spoiling." But in addressing that challenge, it became apparent that "there was a much bigger challenge, which was overfishing." Though many communities in the region were facing these same challenges, "some of the stakeholders were not working together" to address them, she says. If people had tried to get these groups to work together on the bigger challenge right at the start, she says, "it probably would have failed," because there was so much mistrust between the different communities. But instead, she said, "they started out working on this technical challenge," of reducing spoilage, "which built relationships that allowed them to tackle the bigger challenge." The participatory research process included meetings of different stakeholders including government officials, non-governmental organizations, researchers, and residents, which were followed by village-level workshops in 10 communities. This resulted in establishing three ongoing working groups to tackle different aspects of the issue: fisheries co-management, establishing cooperatives and other economic associations, and postharvest processing. Among other solutions, the group decided to introduce salting of fish as an improved preservation method. The overall process led to four significant outcomes, Douthwaite says—none of which had been planned or anticipated initially and thus might have been missed in an evaluation based just on meeting initial, stated goals. The four outcomes consisted of developing a locally sourced fish-processing method (the salting), developing a value chain for the salted fish from harvest to market, creating working groups that could continue to evaluate and improve innovations in the fishery, and improving relationships among the different groups involved, from the fishermen to the government agencies to the traders and buyers. In the end, this led to a growing consensus about the need for measures to prevent overfishing. In the other case studied, the Philippine abaca farmers had been facing a virus that threatened to greatly diminish their harvests of the widely used fiber plant, which is the nation's primary source of cordage and paper. With some regions experiencing a 90 percent decline in harvests, the government's initial strategy was to eradicate all the infected plants to curtail the virus' spread. But farmers were wary of efforts to destroy the plants they relied on, especially when there was miscommunication about what exactly was being done. So when a new, virus-resistant variety of the plant was developed, the local farmers' weren't willing to make the switch, as they considered the new varieties inferior for fiber-making. Instead of just pressing the farmers to change, the team used a different approach, "enlisting the farmers in a process of experimentation," as Hoffecker describes it. Several hybrid varieties were developed, and the local farmers tested them in their fields. "Because they were involved in the process, they were much more receptive to the results," she says. In fact, many of them came up with their own suggestions for furthering the research, including testing local varieties that seemed to be naturally resistant and trying plantings on different kinds of soils and slopes. Many development organizations are well aware of these kinds of complexities and of the need for more community involvement and fewer "top-down" aid solutions, Hoffecker says. A problem, though, is that the metrics and results-assessment frameworks used to measure success often leave no room for complex, emergent outcomes. Instead, they typically focus on measuring the extent to which various solutions—such as a new crop variety, tool, or farming method—are adopted, equating scale of use with success. This research was designed to help provide a basis for new ways to assess the success of programs that are working towards these types of outcomes. "It's a first step in developing such a model and encouraging others to develop such models," Douthwaite says. And such assessments are essential, Hoffecker says, for making development interventions more effective and lasting. Some worthy projects, she says, are "not getting funded, because the results are not understood by the donors. Some projects are producing important outcomes, but they're not being seen and appreciated." Hopefully, she says, this new study can begin to address that need.